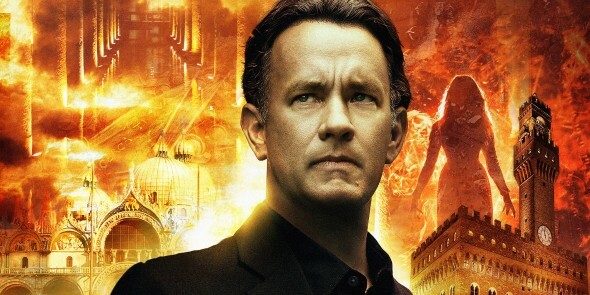 Director Ron Howard’s latest Dan Brown adaptation reprises Tom Hanks as the clearly tenured Professor Robert Langdon, once again caught up in a global conspiracy that will require his knowledge of symbols, art and religious icons to solve a series of puzzles. And this time, it’s not just Catholicism that hangs in the balance—Langdon soon learns he’s tracking a deadly virus that, if released, would wipe out much of the world’s population. Langdon spends the first 15 minutes of the film recovering from a bullet wound and massive head trauma, with no memory of the last few days. He hears voices and suffers violent hallucinations plagued with visions of medieval horror. The quick cuts are unsettling, as if Jason Bourne dropped acid while watching The Omen. The Dantean grotesques invading Langdon’s head and complete lack of plot coherence also hinted at the chance that maybe, just maybe, Howard would pull off the greatest conspiracy of all and turn a lavish studio tentpole into an unhinged Italian horror send-up. It’s not that the thriller portion of Inferno is bad, although it is equal parts frenetic and nonsensical. Based on the source material, though, the relentless pacing is probably for the best, or else you’ll start to wonder when the World Health Organization started building up lethal military commandos without the United Nations getting concerned. Or why nobody is too bothered by the existence of a secret multinational security company that almost destroyed the world. (Or why the movie wastes the electric Irrfan Khan as the group’s leader.) Go in with the right expectations, though, and Inferno won’t disappoint. Where Inferno really misses the mark isn’t so much its tiredness as a thriller but its complete lack of relevance. Paranoid classics like Three Days of the Condor and All the President’s Men oozed 1970s zeitgeist like blood on bitumen. But in 2016, at the climax of the United States election—of this election, in these times—Inferno opts to menace us with an asocial Silicon Valley businessman (played by Ben Foster) whose views on humans are just a hair to the right of some actual Silicon Valley CEOs and venture capitalists. Forgive the plot. Forgive Robert Langdon’s haircuts. Forgive Foster, whose face earns infinite goodwill by reminding you that he also spent 2016 onscreen in Hell or High Water. But in a movie that, including the end credits, makes rational sense for maybe 20 minutes, the biggest unsolved mystery is how little feels at stake—and how unimaginative the film thinks about what the end of the world as we know it might look like.